I don’t think I can stuff a 12.9" long battery in my lawnmower, though! Where is my tape measure? You can do it! but you need like 3-4 of them to get up to 36-48v. The elec-trak’s used 6 6v I would guess in series for 36v, and most of the battery powered push mowers are around 40v. The Earthwise 20" is only 190 bucks on walmarts site right now. It might not be worth your time building. I would have bought anything else . I thought of buying a nisan leaf as storage . Congratulations on your old school L16s. If you treet them well your good for 10 years. If you treet them like you care for them 15+. I wish some of the newer had a track record lke that. It would make choices easier. I did poorly . I don’t feel I had another optionI would have bought anything else . It is actually a really hard time to buy storage right now. There is more activity in the storage sector then we have seen in like 100 years. It is all risky until it has a proven track record, which we are in the process of creating. The costs are also falling rapidly as well. Lion dropped 50% in the last 2 years. When you replace them, you will have a much better idea of what you need and you will have better, cheaper options. There are still people buying Rolls batteries. They are some of the best LA batteries on the market. It isn’t like they are terrible. The market has just changed. Sean is right I am looking at putting in an off grid system and not only are the choices and less proven technology challenging but the price drops drive you nuts wondering what if it is the right time to jump in. It is hard to spend thousands of dollars for something you suspect might drop in price by half in the next year. It is a crazy time for sure. I think you did right by jumping in and getting a setup when you did. I keep telling myself don’t worry if it drops you aren’t buying it to resell you are buying it to use as long as it holds up for the expected life it was cost effective. Sorry I couldn’t stop myself. I do agree too often price is used as a justification to keep doing something which we know is harmful and I have left good jobs making good money because the owners didn’t seem to value the health and well being of their employees or customers. I get that some things have to be dangerous but most of the time that risk can be minimize. During the design process I always tried to minimize or protect people from harmful situations it always bugged me when that isn’t the approach taken. to my TV and computer . blue is used as charger . It made noise on TV . It probably has square wave output, thus noise. Inverters are in the huge price drop catagory as well. The better full sine wave invertors are cheaper and the modified sine wave inverters basically pushed the square waves ones out of the market. If you want to run ac motors like your refrigerator get a full wave inverter the appliances will last alot longer. The square wave inverters are know to be hard on ac motors. Square wave does burn up ac motors and can affect dc electronics that go through wall warts. Modified sine is more common in the low-end inverters now, but you want to check full sine is pushing into the upper end of low-end market as component prices drop. Some thing to think about with full sine wave inverters is the electronics that control them are more fragile than the older square wave type. Know of one case where lightning didn’t hit the house but a close strike turned the wiring in the house into a giant radio antena. The surge backed into the inverter and fried a control board. Midnight Solar makes the best lightning arrester I have used and it probably would have saved it. I had a samlex inverter it went out and I returner it to amazon and got a xantrex inverter both 2 Kw . Samlex had fan run constantly . Using your will be maintained vehicle/equipment batteries as a needs-must bank is correct as what i was trying to promote. Not ideal. No. But very DOable. And at only an ~20% higher cost then it WILL cost you to keep all your electric starting equipment’s, charged, maintained, hot and ready to go. So . . . put in your home-house battery bank. 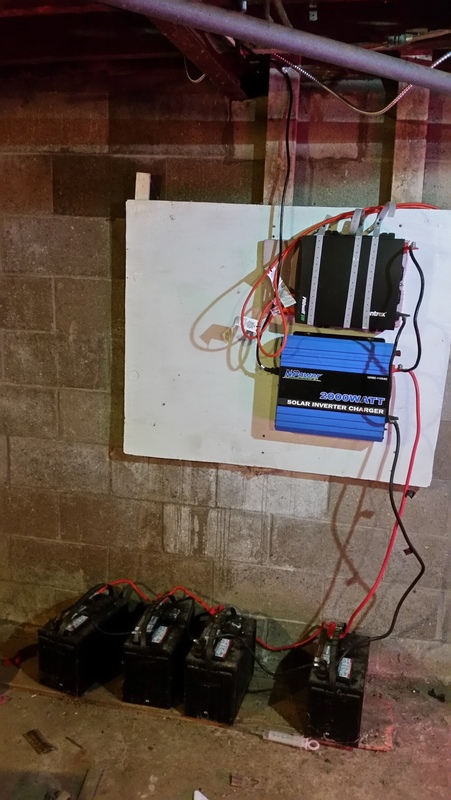 Now get to weekly, monthly inspect and maintain THAT; in addition to all of your electric starting batteries too!! I can count on one hand out all of the hundreds of fellows (and gals) who have set up big house banks who actually Do, Do their banks inspections and maintenance’s. “Form follows Function” An old truism that has to be re-proven over and over again. Wear sensible shoes and boots! “Practical endures. Idealism’s peter-away to crying” Another truism many still must learn. There are good reasons for these Trojan deep-cycle lead-acid batteries to be well known, they work. 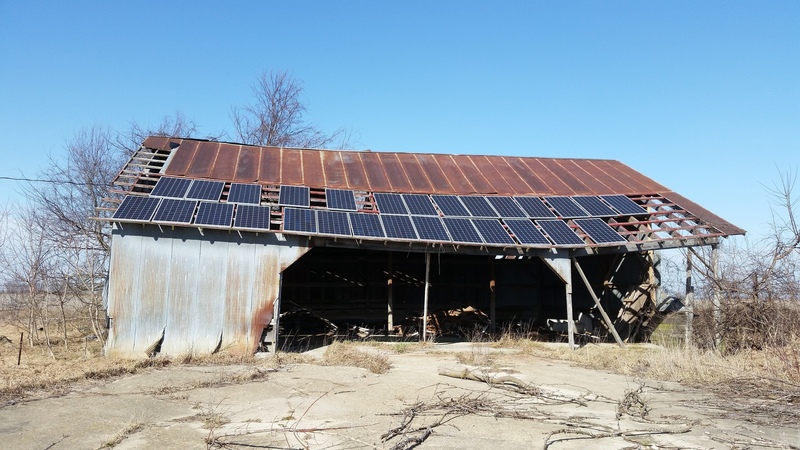 If you need your off-grid system to be reliable, it was a great choice. Li-ion is great for portable equipment, where it needs to be light-weight. I am not convinced they are best in other applications. its been a month on my lithium set up and so far its cut my generator time down to 25% of what I was running and its February this is one of our worst months for solar . time will tell but I would recommend them. That is interesting. I know Australia has a totally different power pricing structure then the United States but the payback they are getting from selling back to the grid at the times of highest need will make batteries pay off fast down there. I can see a system like that benefit both the power system and the home owner as the home owners are basically buying infrastructure for the power grid but getting paid for the ussage of it. but the payback they are getting from selling back to the grid at the times of highest need will make batteries pay off fast down there. The problem with doing that is you need to cover the cost of the wear and tear on your battery system. Otherwise it should work, and even get better as batteries improve. The US generally has extremely poor regulations for compensation of storage on the network. 28 solar panels south facing shed 5 Kw grid tied . Not connected to back up power . trojan batteries grid tied are not connected as back up power yet . Portable Diesel back up generator never needed . Garage doors still not connected to back up power . I like the solar panels but I would be a little concerned that the building they are on won’t last the 30 years the panels are rated for. I plan on putting a new roof up first here because I would hate to see my panels fall off the roof and get damaged.